Our clients range from Fortune 500 companies to start-ups, mid-size companies and organizations, and YPO-like entrepreneurial organizations. Some of these include: AAA, Airbnb.com, Atlantis Resort Bahamas, Blue Cross Blue Shield, Canada Post, City of Edmonton, Entertainment Arts, Fairchild Semiconductor, Farmers Insurance, Finish Line, GE, Halliburton, James Hardie, Kimball International, LinkedIn, Masonite, Mercury Insurance, Panera Bread, Pfizer, PG&E, Stryker, Thrivent, UMB Bank, Vans, and Zion’s Bank. The Adler Group is an acknowledged leader in sourcing strategy development, recruiting and hiring process reengineering, and recruiter and hiring manager training. Click on the links below to find out how our unique programs can help you maximize quality of hire. This is our core training program and is offered in onsite and online versions. Recruiters learn all aspects of hiring top talent from how to take the assignment to finding and recruiting the best active and passive candidates. Hiring managers play a critical role in interviewing and recruiting top talent and need to be well-versed in Performance-based Hiring. This is the first course that combines critical recruiting and interviewing skills into one seamless program. It has been recognized around the world as the best all-around course for managers who want to build high-performing teams. Sourcing the best starts with a comprehensive market-driven strategy. If you're not seeing enough top people you're probably not sourcing in the sweet spot. We created Performance-based Hiring to be the "operating system" for maximizing quality of hire. By aligning every aspect of your recruiting, interviewing, and hiring processes around this objective, hiring top people can become a predictable and consistent process. We'll show you how to improve the performance of all aspects of your investment in technology. Your technology should help you hire more top people, not just manage data more efficiently. Adding structure and control around your high-volume hiring efforts increases hiring accuracy and reduces common mistakes. Our performance-based interview guides can quickly put you on the right path with minimal training. 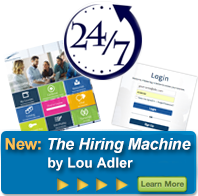 Performance-based Hiring has its root in our executive search practice and is the basis of Lou Adler’s Amazon.com best-seller, Hire With Your Head (Wiley, 2007). We follow every aspect of Performance-based Hiring for each search including the preparation of a performance profile with the hiring team. A Performance-based Hiring executive search is a great way to introduce a company’s management group to Performance-based Hiring and the impact it can have at maximizing quality of hire.